Constellation of practice in e-learning research (Image from flickr) George Siemen’s post about the role of blogs in teaching has prompted me to write something about the way we are planning to use blogs on a new course we are starting in February as part of our masters programme. The course is affectionately known as H809 (codes… it’s an OU thing….) or to give it its full title ‘Practice based research in educational technology’. The focus of the course is about researching with and about technologies. Rather than giving the students lots of content on research methodologies and how they are being used in e-learning and in studying the impact of technologies in education, we have decided to adopt a more innovative approach to the delivery of the course. We want the students to “experience” e-learning research, for them to become members of our research community. This fits very much with Wenger’s Community of Practice ideas and his views on identity and constellations of practice. So instead of “dry content” and our views on what e-learning is about, we have designed the course around a series of seminal research papers which encapsulate some of the key features of e-learning research. We want the students to get a feel for the changing nature of e-learning as a research field, the predominant educational theories and perspectives which underpin it and examples of methodological innovation. But many of the students who are likely to take the course will be researchers or practitioners in the field themselves. So we want to ensure that we can capture and build very much on their expertise as well. Soooo to the role of blogs in the course. We will be asking each of the student to keep a reflective research blog as they work through the course and will be encouraging them to read and comment on each others blogs. We want them to experience the role of blogs in a research context and for them to reflect on their own views of how blogging offers a valuable, alternative communication channel for academic discourse. Hopefully they will find the experience rewarding and maybe even keep on blogging after the course has finished! On the cusp of change - university 2.0? Much like the Industrial Revolution before it, rapid technological change in the Information Age has to date created significant, fundamental change in virtually all sectors of society except education. This may not remain the case for long. A confluence of factors puts increasing pressure on university systems worldwide to change. 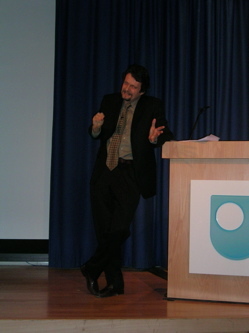 Unfortunately, as Hilsberg (2004) noted, new technologies are considered within most universities only to the extent that they might incrementally improve the cohort-based, paced educational process in both traditional and online environments, without regard for how technology coupled with organizational reform might transform the educative process. It is still unclear whether resistance to change within the academy constitutes anything other than rearguard action. Irresistible technological, economic, and social imperatives seem about to impose significant change on the conduct of higher education worldwide. As I think I’ve said before the pace of change seems to have picked up somewhat in the last couple of years. Are we on the verge of some radical changes to the nature of education, the types of organisations which support it and the roles of those involved (’learners’, ‘teachers’, ‘accreditors’). Would there be any obvious indicators that we were in the middle of such a paradigm shift or will things only become evident after the event?? I really like the idea of an “unconference” - see Tony Hirst’s description of his recent experience at one. I feel increasingly dissatisfied with most conferences I go to. The presentations invariably don’t live up to the promises made in the abstracts and ‘death by powerpoint’ is just plan irritating. Usually the most useful part is chatting to people outside of sessions. Yet I still keep on going and hoping… I think we do need to try alternatives - that really enable us to connect with the work of others, to give us enough space to really critically engage in the many, many tough issues we are trying to address. Unconferences provide a nice example, but why don’t we brainstorm some ideas for other alternatives - ’spaces for critical debate’. So here goes with some ideas, feel free to suggest others! A walking retreat - get a group of people interested in the same research area (learning design, student experience, web 2.0, whatever) and go off for a couple of days on a long trek (somewhere scenic of course). Loose rules but the general aim would be to use the space to talk in small groups or all together around the topic of interest. I can’t claim this is a novel idea, I remember David McConnell saying his group had done something along these lines. A castle in the hills - get a group together (probably with different perspectives and from different cognate disciplines) to tackle a set of tricky research questions. Encourage major critiquing of each others positons and try and come up with a collective set of statements summarising the different positions. We did something like this a couple of times for the development of the Contemporary perspectives in e-learning book, once in Sudeley Castle and once in Dublin. The group was even nicknamed the “Sudeley Group”. I have to say those few days were some of the most creative and engaging that I have been involved with. Online e-learning debate - set up for and against arguments on a controversial topic - lets say VLEs versus Loosely Coupled Systems for example Target key people to kick it off and then sit back and watch the mud fly!!! As part of their establishment of an e-learning research observatory, the HE Academy have commissioned a landscaping study. The observatory will act as a ‘one-stop-shop’ for identifying, collating, assessing and disseminating national and international e-learning research. Given the incredible diversity of research going on, this is very much needed and is to be welcomed. Further information on the reseach observatory is available from the HEA website. The landscaping study is being undertaken by Rhona Sharpe and colleagues from Oxford Brookes. They have set up a consultation wiki which provides more information on the scope and purpose of the study. One way in which they are collating views is via an online survey, so if you have any views on how the observatory should work fill it in!!! I think this is a very exciting development and has the potential to offer a very valuable service to the community. It is now, more than ever, critical that the good research being done on technologies and their impact on students, teachers and institutions is synthesised and then targeted at both the policy and practice levels, because technologies are now having a profound impact on all aspects of education and this impact is only like to increase in the coming years. If we don’t find a way to use the research as a means of understanding these profound changes, we as a sector are likely to make some bad decisions which could have disastrous effects. 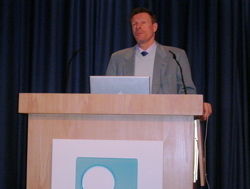 Engestrom takes opposite view – looks at objects and what drives us when we learn and conduct our professional practices. Lave and Wenger 1991. A number of central aspects to the original defintion: CoP bounded local entity which has clear boundaries and membership criteria. CoP has a single centre of supreme skill and authority typically embodied in the master. CoP characterised mainly by centripetal movement from the periphery to the centre, from novice to master from marginal to fully legitimate participation, opposite movement also mentioned questioning, moving out mentioned, but not explored. Aligns with apprentice notion, craft communities, arguably a historical location. Historicizing community – from gemeinschaft to collaborative community – Adler and Heckscher, 2006 Distinguish between three types of historical community 1) strong boundaries, authority, tradition – “gemeinschaft”, 2. Market based, rule based – “gesellschaft” 3. Emerging collaborative community. See a shift or emergence of type three communities – ie boundaries of solidary grops must be far less fixed and far more capable of being bridged and merged. Must accommdate high level of technical division of labour and diversity of knowledge and skills, authority based on knowledge and expertise and not status, must bring values into the realm of public discussion. Want to find a description that goes beyond strong centralised communities of mass production corporations. Geog distribution in the communities which are lateral rather than horizontal and this requires different forms of coordination. Radical change in our understanding of what is work and business and what it means – concept of a career is a notion from the mass production phase!! Who and where are the people involved with this? Mycorrhizae is a good metaphor – growths which are largely invisble, can be huge, each node has a life of its own, but its connected also to a large network. Very hard to kill, but are vulnerable too, can go dormant for a long time, and then become active again. Actors come together for a particular purpose and then disperse again – pulsation of coming together and pulsating together in different combinations -= theorised as ‘swarming’, but difficult to capture and represent. Engagement and disengagement, modelling using tools of AI – a lot of work on this at the moment. Coordinating mechanisms need to negotiation and peer review – they are not process control that we are used to as a basis for mass production. What wildcat activities are not – not jut wikinomics or very large number of people engaged in something, not just social network spaces, not just the internet, they are not just open source. They might be: organisations seeking models that enable continuous engaged self-renewal, innovation and expansion, yet are sustainable and don’t burn out their own energy. There are activities that have such qualities – for example skateboarding, birding (bird watching), and disaster relief of the red cross. Cf. period of rapid and unsustainable economy growth that we are living through. These activities show remarkable sustainability and expansion in spite of severe adversities and constraints. Little money, need a lot of time, high risk of failure etc. Yet these activities are constantly learning to transcend the constraints and overcome the adversities. These activities are paradoxical – pop up and then appear to disappear, longevity and persist over time, dispersed and distributed, yet well coordinated and ware of the whole in each node, offer little publicly recognizable rewards but are extremely highly motivating. Difficult to deal with large scale runaway objects – who should do what? 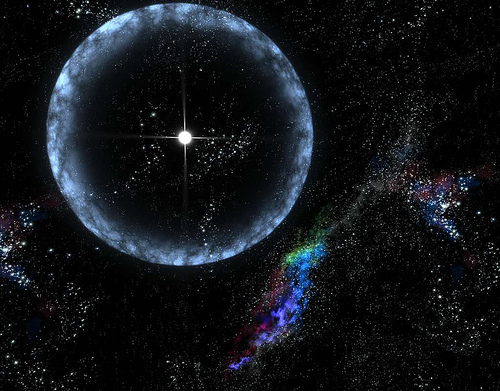 Can we deliberately construct benign runaway objects? What would be a wild cat community?? Scientific revolution move from alchemy – personal construct to a communal process making a statement of knowledge which is then contestable by the community. Move to community base is a key change – stabilisation around an idea – some trust around that idea… Wikipedia, buy cialis when an article stabilises it represents something trustworthy, ailment knowing as a social act. Knowledge is the property of a community. Act of participation even if its an act of contesting the knowledge. Engagement in the production of knowledge. How meaningful it is to engage with partners around something you care about. Engagement with colleagues, in reflection on what we are trying to do, brings me back to the sense of vocation, which is core to our practice, meaningful engagement. Meaningful engagement is the foundation of professional identity. Non-professional communities, group of patients with a rare form of disease. No cure, have to manage your life, they connect on a simple listserve. What are they talking about? Exchange ideas and support, shared experiences, All build from one original person. Important lifeline for those involved in that community. May not post, but are reading and still a meaningful connection and process of learning. Loosely organised community. How do we understand about each others languages – when we are a heterogenous community to cross the boundary between different systems. Community process of negotiating transition, not just about needing the knowledge, its about sharing of ideas and practice and negotiation, what are the skills we need to develop, what is the new shared identity, how do we put all of this into practice when we go home, how can we engage in a new transformation process, entering into a worldwide practice. Clear sense that it was not just a local practice – was world wide. Becoming part of a world-wide conversation. Complex – different institutions – research, practice, regulatory system, or a mixture. Each have multiple constellations of communities and different boundaries between research and teaching, teaching and practice, management and workers, etc. Complex landscape which serves as the body of knowledge, complex social system, each with own perspective and boundaries. 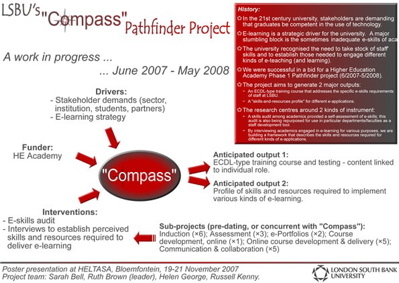 It is beyond mere curriculum – complex landscape of different components. Knowledge ability as the management of identity of a complex knowledge system, what is professional learning and how can an institution engage with learning in this sense? What would it mean for an institution to take this as a foundation for thinking, what is a true curriculum for professionalism. OU is in a unique position to take this position. Learning as engagement in a system of practice. Distance learning could be closer to the practice potentially. Campus based is further from the practice. Role of a university – in role of half way between regulatory agencies and work based practices, also role of imagination, what does a research do? How does evidence based prescription come up, what can I trust, for a curriculum to open your imagination. Problematising boundaries. Tension between regulatory demands and dealing with the situation in hand. Mustn’t fall into assumption that we teacher roles and every thing else follows – in reality practice isn’t like that. How can we use the boundaries – engagement, alignment and imagination. Crossing of boundaries – demands of identity – mixture of accountability and expressibility – part of how we express ourselves as knowers in the world. System of accountability that connects us, expressibility is also important. Become more and more engaged in the community and how expressible that community will be when the individuals goes home and try and apply in their own context. Engaging and reconciling the idea of multiple forms of identity and belonging. Identity is not uniform, it is always that tension between being one person in one body, but many places of belonging and expressions of who we are etc. We are always reinventing ourselves as we move forward. Seems that if you take practice based learning seriously we have to think about how we shape our relationship to these places of practice, so rich experiences of professional identity can be experienced there. How do we transform our whole practices so new learning can be expressed. It is not about curriculum and testing solely – there is a much richer relationship with the practice itself potentially. Managing who you are becomes more important than having access to any particular thing. Notion of a learning citizen – if we all belong to dynamic and complex communities, an ethics of professionalism, trajectory which is unique to you, what is your responsibility with respect to learning in your community. What are the ethics of learning which helps me decide which communities I will be part of? Where are their new communities where things are needed? What does it mean to be a learning citizen? 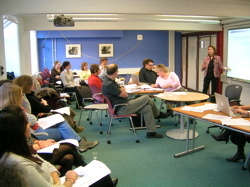 Key tips and hints - there were a number of nice simple success stories, for example the use of Personal Response Systems as a means of getting feedback from a large body of students (Brunel), summarising audit or other evidence-based findings into five simple, keys as the basis of a constructive discussion (Cambridge), and the value of departmental away days at critical points in the process (Reading). We also discussed the importance of presenting data in an appropriate format and who it would be of interest to and when. Common themes. The nature of “brokerage roles” and their importance was a common theme across our discussions and a key aspect of all four projects. We had a lot of discussion too about how projects of this kind inevitably involve working across boundaries. “Planting seeds of change” emerged as a phrase at one point in the discussion (a slight pun as one of the projects is working closely with Plant Sciences) – i.e. using the right people in the right context, a number of the projects had already done this and had success with adopting this approach. Common approaches. 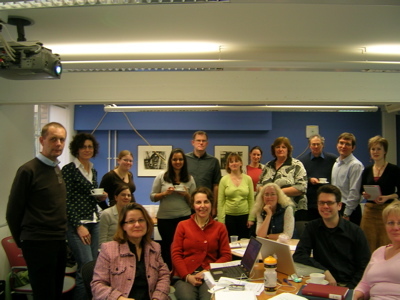 Co-researchers – of staff and students – seems to be a common theme across the projects. The value of evidence base as an approach was clearly something we all agreed on, hence the workshop, but its value was even more evident we felt at the end of the day when we saw the accumulated range of tools and techniques that the projects had produced. The projects are evidently adopting a very self reflective approach to what they are doing and I think part of the value to be draw from these projects will be as much about the process of how they have gone about things, as the final products and outputs they produced. The cluster will be presenting a poster on this work at the Networked Learning conference in Greece and we are in the process of putting together a workshop to submit for Edmedia. Following on from my post about the forthcoming online version of the 8LEM learning design tool, here I have just come across (via big dog, viagra little dog) some of the work that the CETL for Institutional e-learning service has put together on learning design again using 8LEM, nice, simple and effective by the look of it. I particularly like the idea of the design flashcards. You are currently browsing the e4innovation weblog archives for December, 2007.